“No-exam life insurance” has a nice ring to it. It evokes a low-hassle application process and quick turnaround time for your coverage to kick in. No-exam might also sound appealing if you have a pre-existing health condition and worry that a physical exam would disqualify you from getting insured. There is a trade-off, though: No-exam life insurance usually costs more than the alternative. For many people, the convenience of simplified or guaranteed issue insurance could be outweighed by the higher rates. There are also limits to the coverage you can get without an exam. Companies often cap the death benefit for these policies anywhere between $50,000 and $500,000. 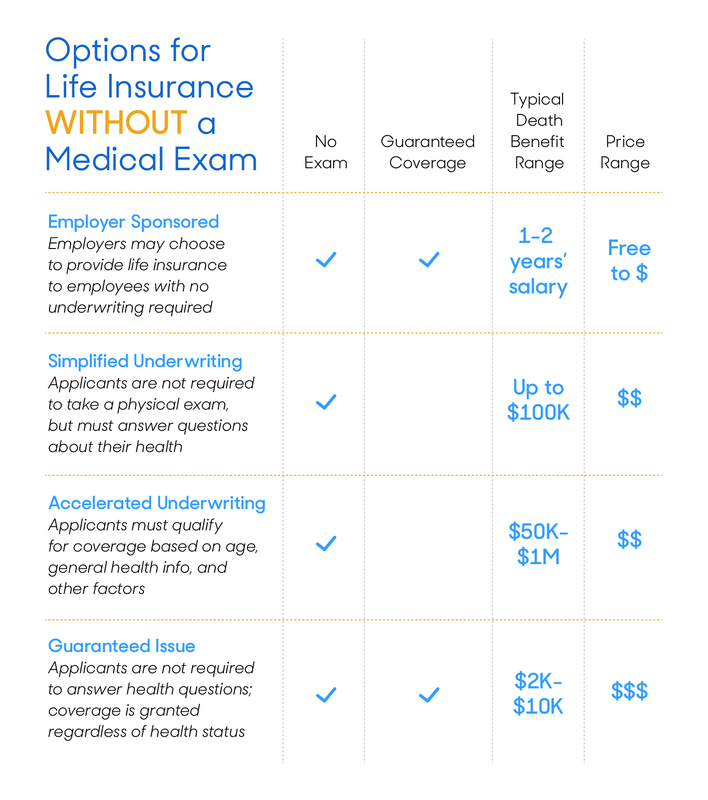 A few disruptors are beginning to test that model by selling no-exam insurance with coverage of up to $1 million, but for the most part, it’s still not the best choice if you need a large death benefit (e.g., if you have a mortgage and multiple kids to put through college). Source: Simple Life Insure. Health ratings are based on insurers’ underwriting standards and will vary by company. Rates shown are for sample comparison only and do not guarantee your own price increase if you elect no-exam insurance. Despite considerations like higher premiums and limited coverage, life insurance with a simplified underwriting process is sometimes the best option. If you have a serious health complication that makes it hard to get life insurance, like cancer or heart disease, foregoing the medical exam can protect you from being denied coverage. If you need insurance ASAP, simplified underwriting lets you skip the waiting period. This might apply if you’re going on a dangerous trip, trying to complete divorce papers, in need of immediate burial expenses, or any number of other scenarios. If you work in a high-risk occupation or have hazardous hobbies, going through full underwriting might raise your rates (even if you’re in good health). A policy with simplified underwriting might be the less expensive option. If you have a recent history of alcohol or drug abuse, a medical exam could mean you actually end up paying a lot more for your coverage. If you have a deathly fear of needles and/or urine cups, well, taking a full physical probably isn’t for you. You might prefer no-exam insurance. No-exam life insurance goes by a few different aliases. You’re bound to come across terms like “simplified underwriting,” “accelerated underwriting,” or “guaranteed issue.” And while these all technically mean you can skip the exam, they also differ in some key ways. Employer-sponsored life insurance is a great start if your workplace offers it. Coverage often comes at little or no cost to you and may even be included as part of your benefits package. However, death benefits are generally minimal. People with dependents might want to look into a separate term life policy to supplement their workplace coverage. If you’re young, decently healthy, and looking for no-exam insurance outside of your workplace, simplified or accelerated life insurance is likely your best bet. These types of insurance consider some health information and are cheaper than guaranteed issue insurance for anyone in a lower risk class. Guaranteed issue should be thought of as a last-resort life insurance. It’s typically recommended for people with serious pre-existing health conditions and seniors who need to lock in end-of-life coverage. Since guaranteed issue doesn’t consider any health information, it’s typically the most expensive option of the bunch. Therefore, when it comes to no-exam insurance, companies charge higher premiums to make up for possible extra risk they could be taking on. Insurers hate the unknown. However, thanks to big data, the “unknown” is becoming a smaller and smaller landscape. Life insurance underwriting just might be on the cusp of a digital revolution — and accelerated underwriting is an early vision of what that revolution could look like. The American Council of Life Insurers describes accelerated underwriting as “the use of new data sources to ‘categorically’ or ‘selectively’ waive fluids and other costly [underwriting] requirements.” In other words, replacing peeing in a cup with a digital background check. Companies like John Hancock are already beginning to tap into wearable fitness trackers as a way to offer discounts for life insurance customers. What exactly are the “new data sources” that insurers are tapping into? Currently, they can access prescription drug histories, clinical lab histories, driving records, credit scores, and criminal records. They can also check in with MIB, a provider-owned database of insurance information, to learn more about you personal insurance history. In the near future, that list could include things like electronic health records and data from wearable fitness trackers. Take data collection to its Orwellian ends, and we might even see insurers cutting rates for customers who sport a six-pack on their Instagram. All that sounds kind of scary — and depending on your views about big data, maybe it is. But remember that nothing is set in stone. As with most upheavals in the information marketplace, there’s sure to be a push and pull between privacy, convenience, and profits. Whether that push and pull will benefit people that have traditionally sought no-exam insurance is yet to be seen. The life insurance industry is moving toward exam-less underwriting, but it’s not totally there yet. Even with new protocols like accelerated underwriting, an IRL physical exam is still the best way for insurers to assign you an accurate risk level. That means most people are going to get better rates if they take the medical exam than if they skip it. Life insurance companies understand that a physical can feel like a hassle, and they do what they can to minimize the inconvenience for you. Most notably, they’ll generally send a medical professional to perform the test at your home so you don’t have to worry about going into a hospital or doctor’s office. The exam starts with a run-of-the-mill health questionnaire. The doctor will ask questions about your medical history and that of your family, current complications, medications you’re taking, and more. After that comes the part that might give doctor-phobes the willies. Your life insurance company will collect “fluid samples” to verify your health condition. That means getting pricked with a needle and peeing in a cup. It only takes a few minutes, but a strong aversion to needles is one reason people might opt out of taking a physical exam. All in all, you can expect your life insurance health exam to last around 30 minutes. Note that there will be a waiting period of a few weeks between when you take your exam and when coverage kicks in, because your insurer has to wait for lab test results to come back and then complete the underwriting process based on that information. Detox for the week leading up to your exam. Cutting back on sodium and staying hydrated can help lower blood pressure and cholesterol levels. Fast for 8 to 12 hours before your exam. Eating before you get bloodwork done can alter your results and cause a poorer read on your liver function and glucose levels. Try to schedule your exam in the morning and eat right after. Stay away from physical extremes before your exam. Anything from alcohol and caffeine to overly strenuous exercise can skew your results. Keep it even-keel for the week preceding your exam to make sure that your health is accurately represented. Learn more about how to shop for life insurance and prepare for your medical exam in our review of the best term life insurance companies.